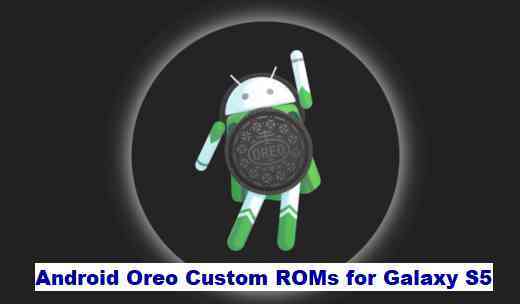 If you are looking to update Oreo for Galaxy S5 Android phone, then here I have list of Android 8.1 Oreo ROMs and a step-by-step guide on how to install Oreo on Galaxy S5. The Galaxy S5 (model: SM-G900F, codename: klte) was last updated to Android Marshmallow officially. Almost all Android phone manufacturers provide 2 years of official update and Galaxy S5 is no exception. It’s the custom ROM builds that keep the devices alive by providing latest Android updates there after. This is the primary reason I have brought you here, how to update Galaxy S5 to Android Oreo 8.1 custom ROM. – Here is the How to install TWRP on Galaxy S5 (klte). Download the TWRP recovery for Galaxy S5 from the Samsung TWRP recovery list. Install TWRP Recovery on Galaxy S5 using ODIN Windows application. Then, download one of the Android Oreo ROMs available for Galaxy S5 and copy the Oreo ROM file to your phone using TWRP MTP mode or sideload. Reboot your phone and enjoy Android Oreo on Galaxy S5. If you are facing any issue while following this guide, then you can comment here or you can create a topic on the Galaxy S5 Forum or on the respective Oreo Custom ROM topics. 1) First thing to do; how to copy software recovery to SD Card? 2) Root: with what? 3) Wipe/ Clean with what? 4) Install Oreo 5) install Gapps to SD card first? AS you have realize I am a bit confused about the exactly the CHRONOLOGY initiating the order of Installing Apps and Procedures! would appreciate a clarification! Thank You! Also I only found that the SM-G900f seems to be the only s5 available for the ROM modification? Can you email me at [email protected]…Thanks again! See, the process of updating the Galaxy S5 to Android Oreo is simple. Well, I feel the guide has enough information to proceed step-by-step, but still I will simplify once more for you. Once you have installed the TWRP recovery, download the LineageOS 15.1 or RR Oreo ROM zip file for Galaxy S5. Copy the ROM zip file (LineageOS 15.1 or Resurrection Remix [RR]) to your phone and restart your phone to TWRP recovery mode. Power off your phone. Press and hold the power button, home button and the volume down button to start Galaxy S5 in TWRP recovery mode.